SCOTTSDALE, ARIZ. – Jan. 3. 2017 – Barrett-Jackson, The World’s Greatest Collector Car Auctions®, will feature some of the most collectible Chevrolet Corvettes during the 46th Annual Barrett-Jackson Scottsdale Auction, to be held Jan. 14-22, 2017, at WestWorld of Scottsdale in Arizona. Among the featured Corvettes is a ’63 Z06 Big Tank Coupe with the RPO Z06 racing option (Lot #1363) that was owned and piloted by legendary racer, Mickey Thompson. Mickey Thompson’s ’63 Corvette Z06 Big Tank Coupe (Lot #1363) is one of 63 N03 Big Tanks built that model year. This Z06 is one of five that GM assigned to Thompson during 1962 and is equipped with the RPO Z06 racing option. It has been researched, confirmed and documented by Corvette expert David Burroughs. 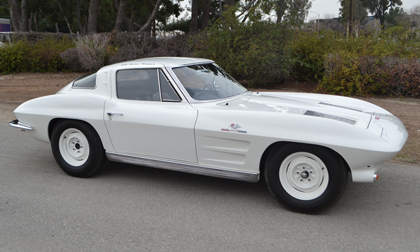 Another race version of the Corvette crossing the Scottsdale block is this ’66 427/425 (Lot # 1391). Raced in Europe by Toly Arutunoff, this Corvette received a frame-off restoration and features headrest seats, suspension, power brakes and transistor ignition. It is powered by a 427/425 horsepower engine with an M22 4-speed manual transmission. The matching-numbers Corvette includes NCRS and handwritten testimony documentation. Also included in the Scottsdale docket is a 2010 ZR1 (Lot #783.1), Serial #0001. This late-model Corvette is the first production car produced in 2010 at the Bowling Green Assembly Plant and features the iconic LS9 6.2-liter supercharged V8 engine producing 638 horsepower. Finished in Jetstream Blue with Ebony Black interior, it only has 4,239 actual miles. Extremely rare and highly coveted Corvettes featured in the Salon Collection include the ’60 CERV 1 (Lot #1390), which was developed by Zora Arkus-Duntov as a functional mid-engine, open-wheel, single-seat prototype racing car. Lot #1369 is one of 116 L88s produced, has only 16,482 original miles and has undergone a rotisserie restoration by Kevin Mackay of Corvette Repair.